Earn 322 loyalty points when you order this item. 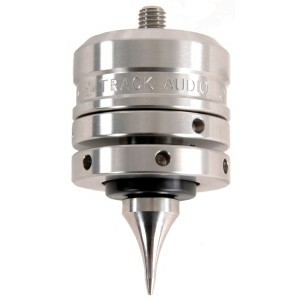 Gorgeously machined and a huge sonic upgrade, Track Audio has created an entirely new approach to speaker spikes. An off-shoot of a British machining company with clients in the military, aerospace, medical and automotive industries, Track Audio creates astonishingly high-quality products from high grade steel. Designed to last a lifetime and sound great doing it. The Isolation Feet use modular screw-in inserts on the top to allow them to be used with a broad variety of components. Machined from the same high quality stainless steel as the spikes, the inserts are available in a variety of different threads.